Following Saturday’s brutal attack on peaceful protesters by private security mercenaries and vicious guard dogs acting on behalf of Dakota Access Pipeline interests, it has been revealed the company responsible for construction deliberately targeted documented sacred and culturally significant areas for demolition — and crews likely chose the holiday weekend in order to avoid a court injunction. On Sunday, the Army Corps of Engineers backed a motion for a temporary restraining order halting further construction. A federal judge ordered an emergency hearing, which will take place later today. Standing Rock Sioux and protesters from at least 100 Native American nations and their supporters discovered Energy Transfer Partners construction crews had decimated sacred burial sites and historic and culturally significant landmarks early Saturday morning — less than 24 hours after the tribe had filed court documents concerning sacred sites. The tribe’s historians had not been permitted onto the private property until recently to assess whether the area held cultural or other significance. When demonstrators attempted to peacefully block crews from further destruction, security guards, or rather, mercenaries pepper-sprayed, tear-gassed, and indiscriminately sicced attack dogs on the crowd. Six people were bitten, including a pregnant woman and a young child, who reportedly had to be hospitalized. As Mentz explained, shallow graves in which the dead are buried under rock cairns are common in this area — thus even the relatively shallow one-foot depth the crews removed likely disturbed a number of gravesites. Mentz — like other protesters, advocates, and observers — suggested retributive, deliberate foul play on the part of the pipeline construction company in the decimation of these sacred sites, as he described the nearest active construction area being located some 20 miles away. He and others believed that construction was in no way imminent anywhere near the area he’d surveyed — in fact, in a court filing, Mentz mapped and pinpointed precise areas of concern to the tribe. “I do not believe the timing of this construction was an accident or coincidence,” he stated. “It appears that DAPL drove the bulldozers approximately 20 miles of uncleared right of way to access the precise area that we surveyed and described in my declaration” to the court. In a statement calling on intervention by North Dakota Governor Jack Dalrymple, Chairman of the Cheyenne River Sioux Tribe Harold C. Frazier called the antagonistic attack “an act of terrorism,” and denounced law enforcement for implying protesters broke the law first, thus forcing security mercenaries to act. 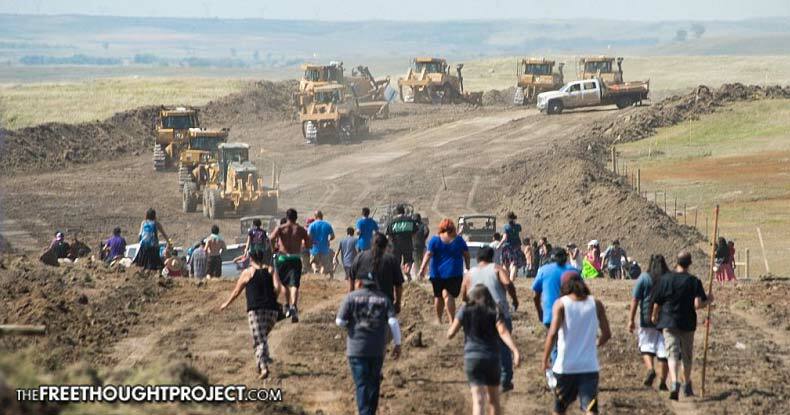 North Dakota homeland security callously removed the protesters’ water supply after similar unconfirmed reports of lawlessness. Witnesses also described cell service suddenly cut immediately before dogs attacked demonstrators — and while police were not on scene, at least one helicopter circling the overhead was believed to be law enforcement. Worse, according to Archambault, pipeline construction crews returned to the same area on Sunday — after the outrageous attack — to continue annihilating the sacred area. On Monday, despite the Labor Day federal holiday, James E. Boasberg — the same judge presiding over Standing Rock Sioux’s lawsuit against pipeline construction — took action by ordering a hearing on Tuesday in Washington, D.C., concerning both the attack and destruction of the documented significant sites. In a court filing, the Army Corps of Engineers — the primary defendant in the case — agreed that, in order to maintain peace and public safety, it supported the motion for an emergency temporary restraining order. Despite continuing construction by Dakota Access, the Army Corps of Engineers has yet to issue the required easement permitting construction to take place. Boasberg is expected to rule on the larger issue on September 9. Deliberately targeting sacred sites for destruction belies a darker motivation beyond typical corporate profiteering — in fact, it shows a sickening and unprecedented degree of malice with no possible justification imaginable.